Is Bean Wax Really Painless? Review and Before n After Photos! | Sahrish Adeel - Malaysia based Pakistani Beauty & Lifestyle Blogger! 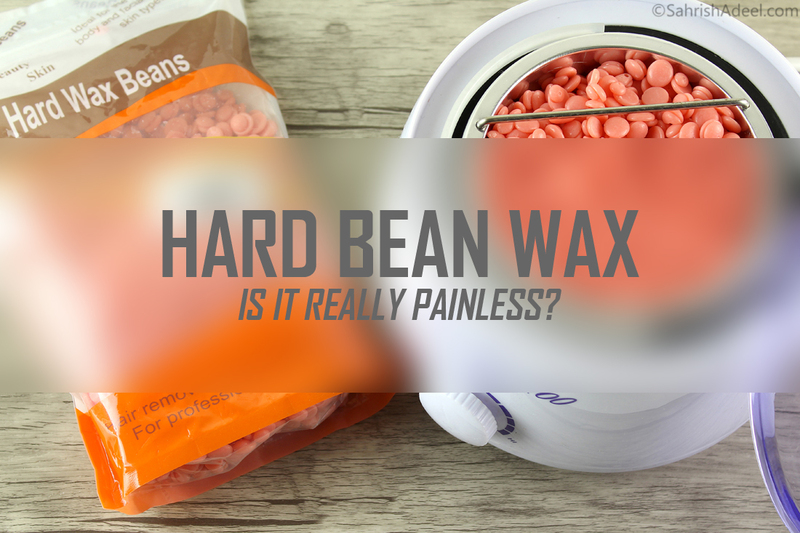 Is Bean Wax Really Painless? Review and Before n After Photos! Bean wax has been given so much hype and it was one thing on my list that I had to try myself. I have been getting this wax done from the salon but since I have also been using sugar wax with the strip for years, I thought trying bean wax will be easy for me. Ever since people knew I bought this, the most asked question was; is bean wax really painless? Today I will be talking about my at-home experience with bean wax, before n after photos and places where you can buy the product from. Enjoy reading! I wrote many things in one blog post earlier but it became really long and cluttered so I thought to break it down into a series of posts. Subscribe to the newsletter or join me on my social networks to get informed about next posts in this series. First of all, this same type of bean wax is available with various brand names. When you search online for bean wax, you will see this packaging in first few results and I got this because it was reasonably priced and was easily available. I will be including links to places/shops you can buy bean wax from at the end of this post. Even though this type of wax comes with many brand names but from what I got my hands on (I tried two different names but same packaging), they are exactly same. Each packet contained 300 grams which was enough for both full arms, both half legs (knee to ankles), both hands and both feet, both underarms, upper lips and I was still left with some. The wax starts to melt really quickly in my wax warmer and it completely melted within 10-15 minutes on full heat. This wax melts into a creamy consistency. Wax stays on a moderate temperate if I keep my warmer in between its medium to high, temperature setting for the whole waxing process. The wax smells like plastic and I noticed a mild plastic burning smell when I heated it first but I did not notice anything after the first use. It dries super fast, does not tear and leaves no residue (if used properly). It took me some practice to get to a moderately-perfect application, so don't give up if you cannot do it the first time. I get really red skin with bumps all over my arms and legs with sugar wax (with the strip) but with bean wax, the amount of redness was one-tenth and I did not get any bumps at all. My skin was not itchy for most parts and redness went away in a few hours. Please read my experience below for any questions that you still might have in your mind. I will break this section into two parts; my first experience as a newbie to this type of wax and then my experience after a few trials. Hopefully, you will get a better idea of what to expect on your first time. The wax melted completely in a few minutes and application was not too difficult but it was uneven and I could not get that perfect lip at the end which becomes the actual tab to rip off the strip. The process was fairly okay on my left arm but I ended up breaking some hair on my right arm. I was not able to apply the wax properly on the back of my upper right arm which made me really frustrated and it also resulted in some leftover residue due to uneven application. The first experience on my legs was really easy though. I wasn't able to have an even application on my first try but later on, I got a hang of it and I liked the results but I was again left with some residue. I used oil to remove the residue but it didn't work and I had to spend next 40 minutes picking up each tiny plastic piece, by hand. I literally was on the edge of crying and I told myself, never again! I also made a mistake of using my trusty metal spatula and once the wax dried I had no other option but to throw the spatula in the bin. I am still sad about it. =( Anyways, two days later, I took my wooden spatula and used the wax on my upper lips and underarms and oh my my my =D. I immediately fell in love. The application on upper lips was so smooth and perfect that I was feeling proud of myself. The application on underarms was slightly difficult but I worked on each side in two sections and the result was flawless. I told myself that I will only be using the wax for these two processes. Round 2 - I had to wait many days to give this wax another shot on my arms and legs and to see what I can do about the residue and application and if Bioderma Sensibio H2O will really work this time or I just had some false hope. This time I used the wooden spatula and started on my arms. The wooden spatula made a huge difference in application plus I had a bit of practice already so it felt easy this time. It still took me quite some time to finish the arms and I was left with bits of residue but it wasn't as crazy as before. I used the Bioderma Sensibio H2O and I kid you not, it worked like magic. 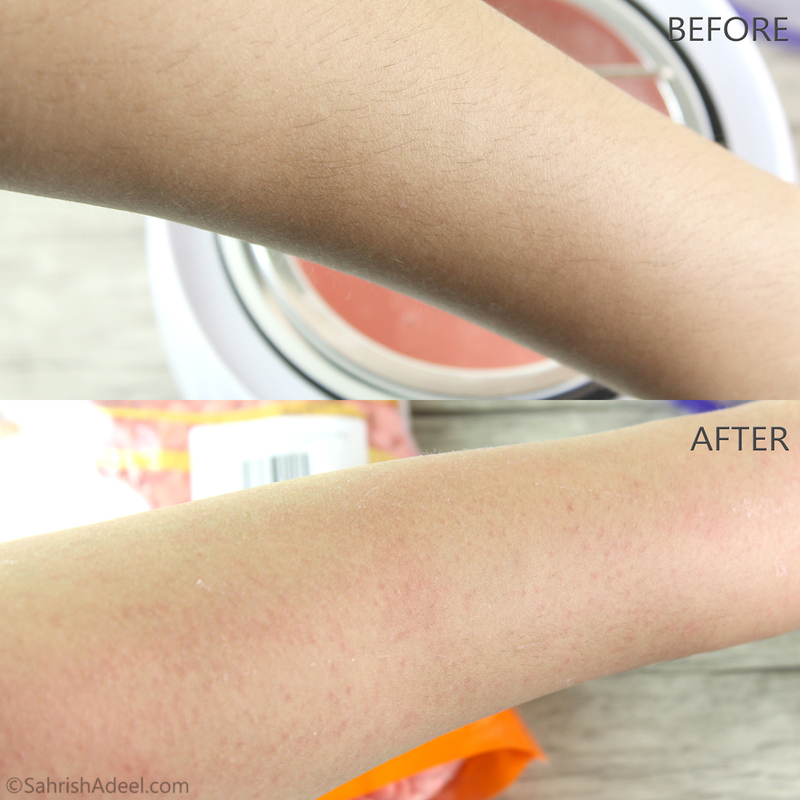 I will still say that using bean wax on arms is not my favorite method because I just cannot reach places easily. On the other hand, I timed myself on one leg and it took me less than ten minutes to wax knee to ankles on one leg. The residue was minimum because now I was able to form decent tabs and the thickness of the strips was pretty decent as well. And again, the residue was wiped easily with Bioderma Sensibio H2O. Now I have another use for this amazing product! The final verdict of these trials - After all of those experiences, practices, and trials, I am happy that I gave this bean wax a try. I have now said goodbye to my salon for my upper lips and underarms because I will be doing it at home. I will still prefer to use my Epilation Set by Philips or regular strip wax for my arms because it is easy and quick for me but I will keep on using bean wax for my legs, upper lips & underarms. My threshold of pain is different on each part of my body and I am sure most of you are the same. I would like to mention that this bean wax does not stick to the skin unlike sugar wax (with the strip) which is the biggest cause of unnecessary pain during the hair removal process. If you have a few hair on a part of your skin and you apply a strip of bean wax, you will see that it only pulls the hair and it comes off of the skin like a piece of cloth was placed on the skin. Sorcery, isn't it? - I cannot stand threading on my upper lips anymore but I do use bean wax happily. It hurts hundred times less on upper lips and the slightest tingle I feel is from pulling the hair out. - For my underarms, sugar wax (with the strip) pulls the skin and one sudden pinch is all that I feel but with bean wax, I did not feel anything at all. So for this part, yes it was painless! - For my arms, I feel the sugar wax (with the strip) is less painful than epilator but with bean wax, I only felt a slight pinch on some places on my arms which is nothing compared to other two methods I mentioned. - And for my legs, I feel mild pain on my legs and knees but with bean wax, I literally did not feel any pain on my legs except for my knees but it was a lot less than any other method I have ever used. Overall, I am loving this method of hair removal. 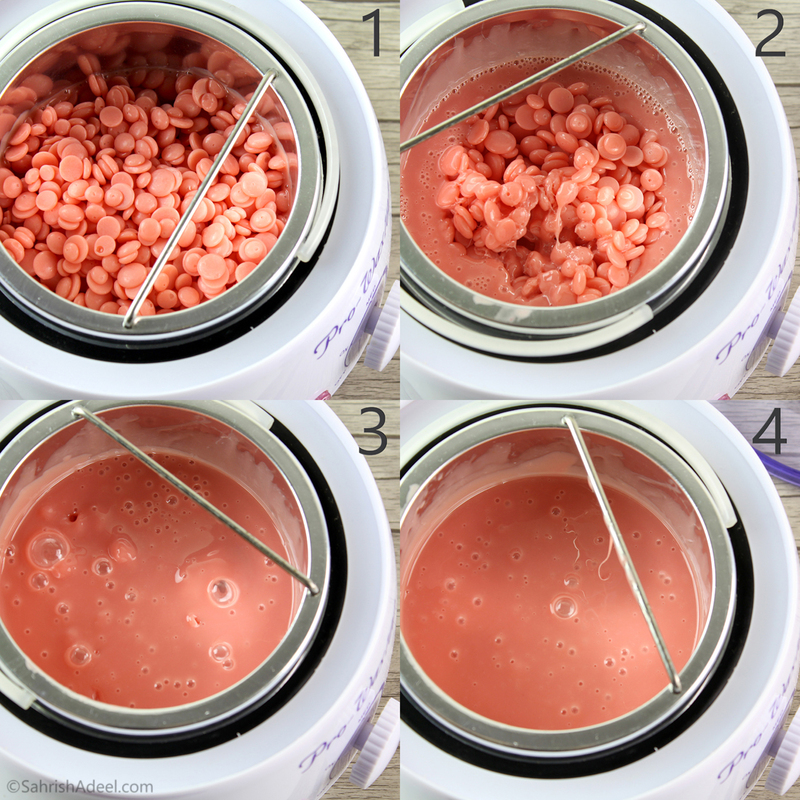 I love how mess-free, quick and almost painless this wax is. I would highly recommend that if you want to give at-home waxing a shot, try this method. Bean wax is great if you do the full body at home or even if you do just some specific parts on regular basis. This method is a lot less painless than any other method I have used and definitely a huge money saver. So, here was the summary of my first experience and then many experiences later on. I tried to cover as much as possible but if you have any questions, leave them in comments. I will be publishing a few more posts on bean wax, covering various concerns and queries that I get from my family, friends, and readers. I really wanted to share this and will share more because before trying hard bean wax myself, I literally wasn't able to find as much information as I wanted to have. Seeing people pulling a strip or two in their first experience review does not give you all ins & outs and troubles that you will face while relying on this method of hair removal. Hard Bean Wax is vastly and easily available online and you can find it at following links. I will try my best to mention countries for all the links as well. If you know about a place that I did not mention, please feel free to leave a comment. I am also including links to buy Bioderma Sensibio H2O, in case you want to check it out. All links are clickable and will open in a new window. I hope this post was helpful in some ways. Subscribe to the newsletter or join me on my social networks to stay updated for upcoming posts in this series. My username is SahrishAdeel on Instagram, Snapchat, Twitter, Pinterest & Facebook. See you there!